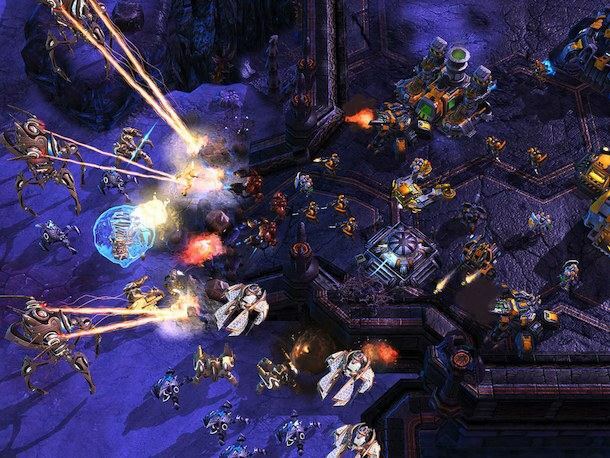 The popular real time strategy game Starcraft 2 now has a demo version available for Mac users. You might want to check out the Starcraft 2 Mac system requirements before getting the demo, but it’s safe to say that the newer your Mac the better it will run. You can download the Starcraft 2 Mac demo at Blizzard’s BattleNet page. You don’t need a Battle.net account, but you will need to fill out your name, email address, and birth date to get the Blizzard downloader app which installs the Mac demo for you (same thing for Windows too, for that matter). The demo offers the first three missions of the campaign and solo skirmish play as Terran vs Terran, there are no time restrictions but it appears that there is no support for multiplayer gaming in the demo. Of course you can always just buy the full version of Starcraft II: Wings of Liberty from Amazon for $10 off, I’d be impressed if you could play the demo and not get thoroughly sucked into the addictive gameplay. Multiplayer is even more addictive than the singleplayer campaign. I don’t really play with other players, so this version is perfect. « Can Your Mac Do This?